This is a great stealth and camouflage game, made by Konami. Soldiers of Outer Heaven have blackmailed Dr. Pettrovich to create Metal Gear, a walking tank (Robotic tyrannosaurus), that has a full nuclear capability and can traverse any terrain. Gray Fox, a FOXHOUND agent was sent to search for information and stop the construction of the Metal Gear, but was captured. Solid Snake, a new FOXHOUND agent is sent to the Outer Heaven to destroy Metal Gear. He must find out what happened to Gray Fox, and find Dr. Pettrovich, the Metal Gear creator. He is only guy that knows how destroy it. 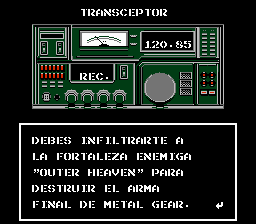 Outer Heaven is formed by five buildings guarded by various soldiers, vigilance cameras, infrared lasers, six mercenaries (Guard cells), two active tanks, two human robots, and the mysterious boss. Solid Snake can steal weapons and enemy equipment, speak with the base with a transceiver and speak with hostages who know about Metal Gear, Outer Heaven and about Dr. Pettrovich. 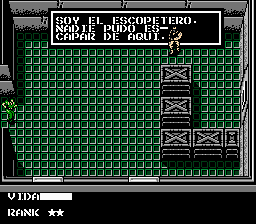 Although, when entering a room with gas, it is impossible to come out without lose something of life, because Solid Snake must remove the gas mask to open the exit door with a card. 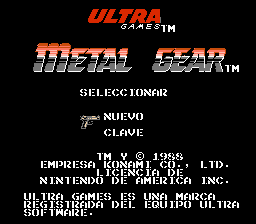 The Metal Gear does not appear in the game, because the game could not bear the sprite, being replaced by a supercomputer that controls the Metal Gear movements. It is a maze with the way to where Dr. Pettrovich is locked, but NOBODY tells you the way. But the game is very great with their continuations, facts, and history. 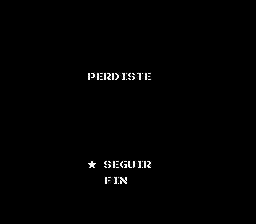 Hideo Kojima (Original Metal Gear creator) has complained about this version, due to absence of Metal Gear, but the sequel (Snake’s Revenge) is much better. 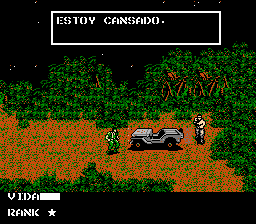 This is a Spanish (Latin America) version, of one a great stealth and camouflage game, made by Konami (A great Japanese company, game creator). Mercenary’s names were translated (Less Big Boss’s or Coward Duck’s name). A spelling mistake (Grey Fox) it has been corrected (Gray Fox). In some discussions, some help has been added.